This Peanut Butter Apple Pie Smoothie is creamy, packed with apples, and has a subtle hint of cinnamon and peanut butter. 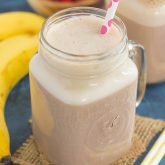 The oats give this drink a thicker, pie-like texture, while the yogurt and spices give it the perfect touch of sweetness. 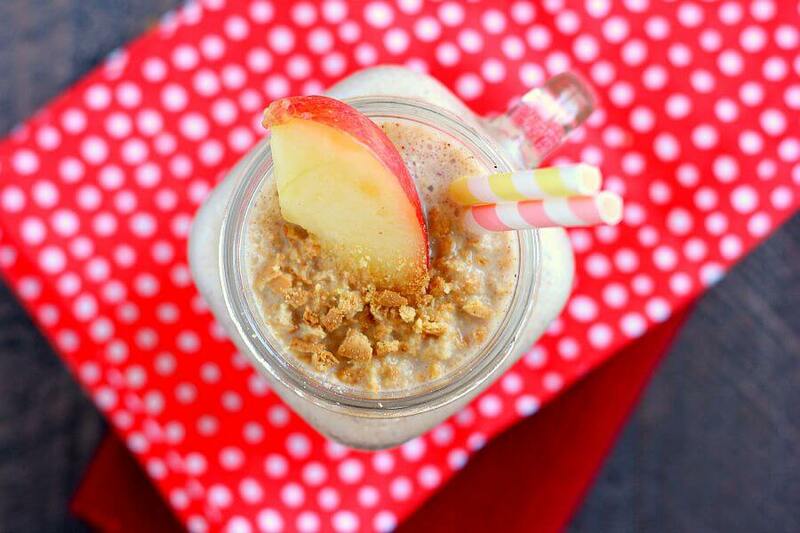 If you love apple pie, then this smoothie was made for you! The day is finally here! I can FINALLY start sharing some of my latest (and greatest) fall recipes with you. I’ve been holding out on these treats since the beginning of August, guys. And it was no small task, either. Every time I would test a new recipe, I would immediately break out into my happy dance and then remember that I made a deal with myself to not share anything until September. After all, Labor Day needs to have come and gone for it to feel more like fall, right? Well, even though it’s not officially the first day of fall yet, I figured the second week of September isn’t too far off. It may still feel like summer outside, but all things apples and pumpkin are happening in my kitchen these days. And first up is this Peanut Butter Apple Pie Smoothie. Smooth, creamy, and bursting with fresh apples and peanut butter, you can enjoy the classic pie in drinkable form! Apples, vanilla yogurt, oats, and peanut butter create an irresistible combination that is both nutritious and delicious. Add in some spices and graham crackers, and this healthy drink is perfect to ring in the fall season. And trust me when I saw this Peanut Butter Apple Pie Smoothie tastes just like it sounds. It’s creamy, packed with apples, and has a subtle hint of cinnamon and peanut butter. 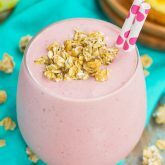 The oats give this drink a thicker, pie-like texture, while the yogurt and spices give it the perfect touch of sweetness. 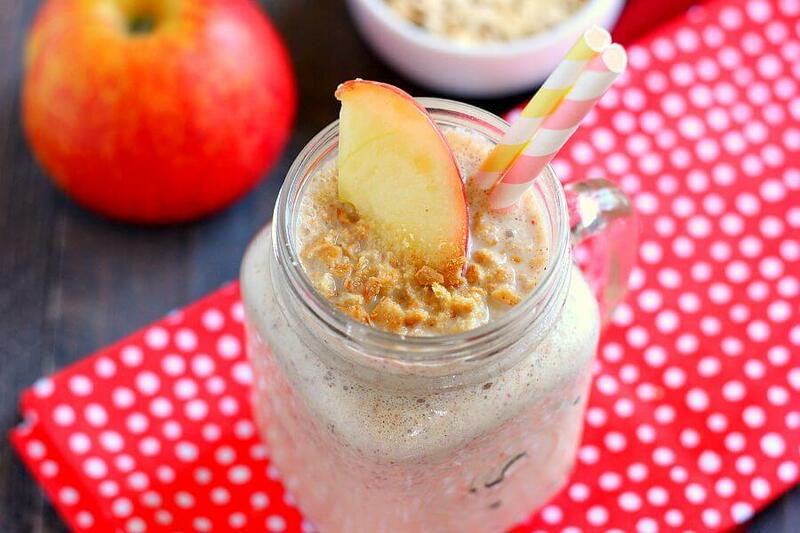 If you love apple pie, then this smoothie was made for you. Ever since I made this Peanut Butter Apple Pie Smoothie last month, I’ve been making it non-stop. It’s rare for me to make the same thing more than a few times, but I definitely hit the jackpot with this drink. I also love the pretty flecks of red throughout the smoothie. It just looks like fall, doesn’t it? This smoothie takes just minutes to whip up and tastes like fall and apple-y goodness. And because I will soon be taking my annual trip to the apple orchard, I can’t wait to stock up on more apples for this drink. And trust me, guys, you need to do the same. Not only is this Peanut Butter Apple Pie Smoothie refreshing and delicious, but it’s packed with protein and healthier ingredients. This drink makes the perfect grab ‘n go breakfast or post-workout snack! Looking for more smoothie recipes? I’ve got you covered! In the canister of a blender, combine the apples, oats, yogurt, milk, peanut butter, graham crackers, cinnamon, nutmeg, and vanilla extract. Pour into two tall glasses, top with an apple slice and graham cracker crumbs (if desired) and serve immediately. Thanks for the kind words, Sarah! Peanut butter and apples are one of my favorite snacks too, so it was fun to make this smoothie! This is just beautiful! Healthy and delicious and served in a mason jar - what could be better?? Thanks for the smoothie love, Kate! I'm very excited about fall recipes ! I usually make a pb smoothie for breakfast (or a snack), but adding apple sounds like a great idea! Will definitely try it! I think you would love the addition of apples, Mira! It's SO good! While I am not ready to let go of summer fully, I am ready to slowly incorporate more autumn food into my life... especially if it comes in the form of a peanut butter apple pie smoothie!! You make the BEST smoothies, Gayle and this one is no exception! I LOVE that you used oats in this as well! You are always SO clever! 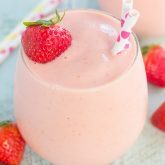 This smoothie looks divine... and like it needs to be devoured ASAP! Pinned! Cheers, girlfriend! Gayle, this looks delicious! PB and Apples are one of my favorite snacks and no doubt a pie/smoothie version would knock my socks off! Thanks for sharing! Thanks, Amber! This smoothie combo is one of my favorites! Thanks, Jess! I think you would love this! Peanut Butter and Apples are meant to be together aren't they?! I love that you added some graham crackers too! I like a little crunch with my smoothies! Yes! Peanut butter and apples make the best combo! Thanks, Annie! Peanut butter and apples is one of my favorite combinations ever! I've never thought about it in a smoothie, but now it's all I can think about! This looks amazing! Thanks, Michelle! It's one of my favorite smoothies! This looks so perfect for an afternoon snack, Gayle. I love fall, but I just can't wrap my arms around the season yet. This is a good stepping stone. Thanks, Linda! I'm not quite ready for fall either, but I am ready for all of the fall treats! Ah you sound like me! I've been dying to put out fall recipes! So glad you shared this! Yay for fall! This smoothie is such an awesome way to kick off apple season! Apple and peanut butter is such a great combo! It looks incredible, Gayle and I love that you added graham cracker crumbs in here! Thank you, Kelly! 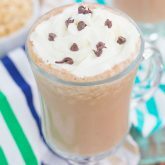 The graham crackers add a nice crunch to this drink! Thanks for the kind words and for stopping by, Claudia! Gayle love this idea! Lately I am on a smoothie kick and I need to make your version soon! Smoothies are the best, Ami! I love creating new flavors, it's just so fun (and delicious)! You are so organized Gayle, I wish I had been recipe testing since August lol This looks awesome! I love peanut butter and apples so I can only imagine that this smoothie is heavenly! I can totally picture your happy dance as you tested fall recipes! It's so important to love what you do. And you clearly love it! Plus, this is the most amazing flavor choice ever. I need you to be my smoothie maker! I love adding oats to smoothies, it makes the so much thicker and filling! 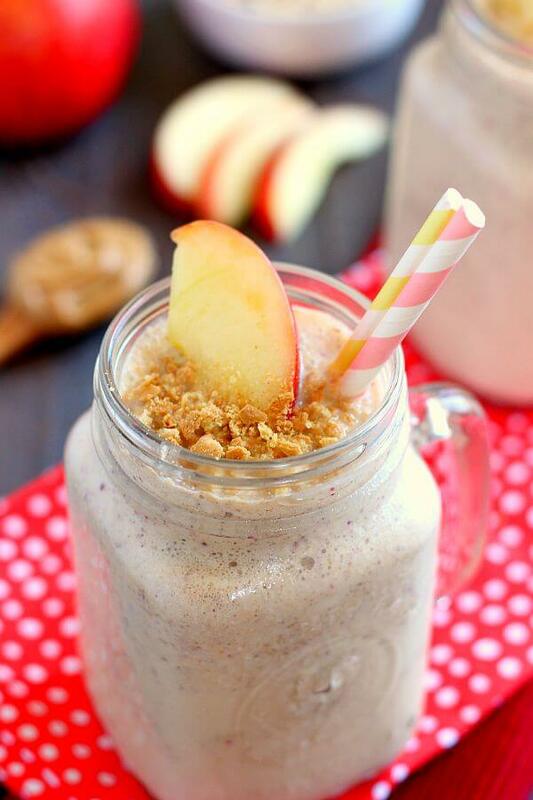 I'm loving this apple pie smoothie, especially with that peanut butter in there too. Gayle, I love this!!! Hooray for all things apples and pumpkin!!! love peanut butter and apples together .. what a great idea!!!! love this smoothie! Adding the graham crackers is such a fun twist!! I am all about the fall flavors!! And this smoothie is a great way to combine cold and fall!! Thanks so much for the kind words, Sam! Thank you, Keri! I think this would work perfectly as a healthy dessert, too! And I totally wish summer would last for forever! I need more smoothies in my life! Especially this flavor. Apples and peanut butter are one of my favorite snacks. This smoothie is screaming my name! Thanks, Jen! I think you would love this smoothie! Like I don't eat enough peanut butter, now with this smoothie I will start drinking it too, and most likely will turn into a walking peanut lol, but at least its worth it! Haha turning into a peanut is definitely worth it! Thanks, Katalina! love the flavors in this smoothie Gayle! looks delicious! What a fantastic smoothie for fall! Love that you used graham crackers! haha I feel like September / after Labor day is the perfect time to start sharing fall recipes! :) This smoothie sounds perfect! It's still so hot by us so I've still been drinking smoothies like mad! It's still hot by me too, so this is perfect for right now, Ashley! Thanks! Bring on the fall recipes because I'm so ready for them. I'm ready for cooler weather, too. I don't know, but Michigan has been a little bit too hot for my liking this summer. I'm not asking for snow or anything, but I can't wait for the weather to cool down a bit. This smoothie looks so good and it sounds so healthy. I'm pinning this so I can try it one day. Yum. I am ready for the cooler weather, too! Hopefully it will come your way, Neeli. Thanks for the kind words and pin! This is such a great smoothie flavor, Gayle! 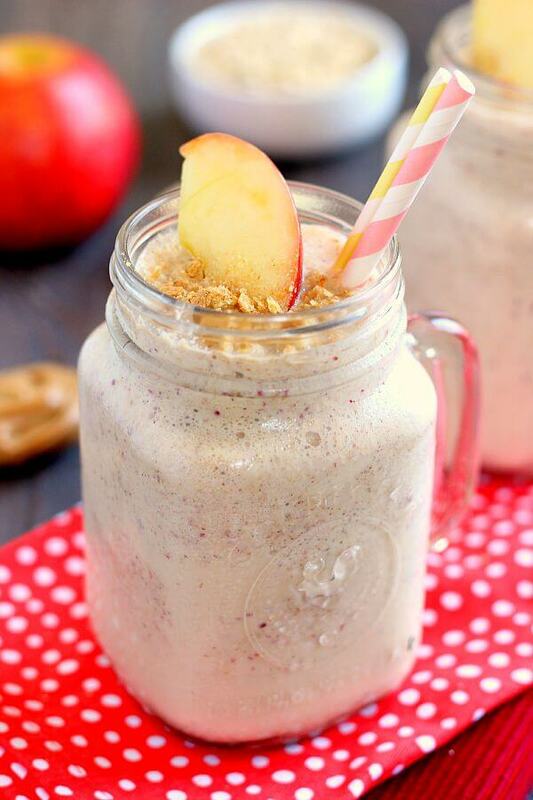 I love apples with peanut butter, so I'd be all over this smoothie! With oats and yogurt, this is the perfect breakfast, especially since it's been 100 degrees here in CA! Thank you, Marcie! The flavor is so refreshing, especially since it's still warm here, too! Yay for fall and delicious fall recipes! This smoothie sounds incredible!! Gayle I wish I could be organized like you! I haven't even started making fall recipes yet. Oops. Hehe. Pinned! I'm so excited for fall recipes, Cyndi! Thanks for the pin!